Things got busy and I stopped posting for a while. Admittedly some of that stemmed from disillusionment, and I’ll get into that in a minute. Long story short, I’m back. Not sure how often I'll be posting, but we'll see how it goes. I may just have a second career at the Psychic Friends Network. A quick review of my 2009-10 season preview article from last October proved that my predictions were pretty much right on the money. I forecasted a 54-28 record, good for 2nd in the Northwest, 4th in the West, with the Jazz losing to the Lakers in the Western Conference Semifinals. In reality, the Jazz finished with a 53-29 record, good for 2nd in the Northwest Division and 5th in the West (they actually matched Denver for the 4th-best record but lost the head-to-head tie breaker). And yes, they lost to the hated Lakers in the Western Conference Semifinals. While I'm admittedly pretty impressed with my prophetic skills, the spirit of my prediction is where my disillusionment comes in. I knew before the season even started the Jazz would post a decent record but would not be legitimate title contenders unless they made some roster moves. They did make moves (trading away young talent like Maynor and Brewer for little more than cap relief), but obviously not the kind I was hoping for. The Jazz had a decent season and were right there in the mix in the West, but they had no shot at getting past the Lakers (though I did expect them to win at least one game…) Frustrating to say the least. At least they sent the Nuggets packing in the first round. That was a nice consolation prize. In summary, this season was a disappointment. The Jazz played it conservative, as usual. And they were good but not great, as usual. 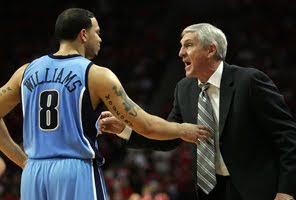 Deron Williams – He became the best point guard in the NBA this season. He just keeps getting better. Paul Millsap – He made the Jazz look smart for matching his contract. His stats were held down by Boozer’s continued presence, but Sap had a strong year and continues to grow as a player. Wesley Matthews – Where did this kid come from? I still can’t believe he was undrafted. I hope he stays a Jazzman for a long time. CJ Miles – He stepped it up big time in the playoffs. CJ has teased us before, but hopefully this is truly a sign of things to come next season. Carlos Boozer – He actually played well and rose above the ugliness of the previous offseason, but he missed the regular season finale – the game that could have propelled the Jazz to the 3rd seed and allowed them to avoid the Lakers until the conference finals. Typical Booz. The real negative is that the Jazz failed to trade him and get something of value in return. Now they will lose him for nothing this summer. Andrei Kirilenko – He was having his best season in years until he got hurt. Seems like if his body is healthy, his mind isn’t, and vice versa. He just can’t get it together consistently, which is a huge shame. Eric Maynor – I’m still sick the Jazz traded him, especially since they did nothing but pocket the money they saved. That kid will be good. Kosta Koufos – I expected a breakout year from him, but it didn’t happen. Not sure if he’s going to make it. Kyrylo Fesenko – He made an impact in the Denver series, but he still doesn’t really seem to get it. He has all the physical tools but seems to lack the mental capacity to be a good NBA player. He’ll probably get one more chance to get it together.